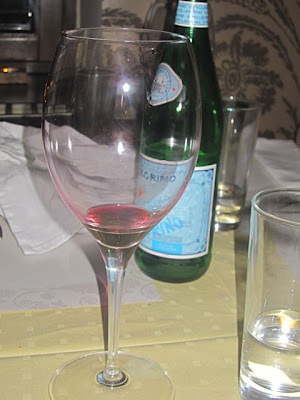 I first heard about Ristorante Porto almost a year ago, when "Christine" recommended it in the comments to my post about Osteria Da Clara. She told me the Italian/Mediterranean restaurant in the up and coming Karlin neighborhood was very good, and she'd love to know what I think of the place. But I usually need more than one nudge. More recently, I read a few positive reviews on Expats.cz, and they reminded me about the place. I didn't know these people personally, though I knew "Charlie" as a regular poster about food. So I passed word to my friend, Hana Montanová, who works in Karlin. She had lunch there a couple of times and gave it a thumbs up. That was the tipping point. That, and the fact that Prague 8 is sorely underrepresented among my postings. Cloud 9 Sky Bar & Lounge was the only other place there I'd done. Jersey Girl, the Englishman met V and I for dinner at Porto on a Saturday night. We walked in and were greeted by two musicians I'd seen many times before around town. Boro and Janis (Ioannis) play acoustic guitars and sing beautiful harmonies on everything from Elton John, Eric Clapton, and the Eagles to a wide variety of folk tunes. 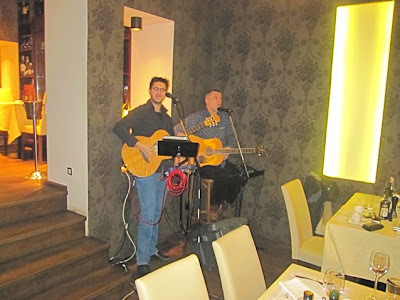 I wasn't expecting live music, especially since the restaurant is somewhat small, but it was a nice surprise. 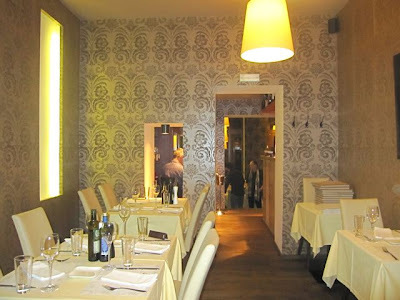 The restaurant has a modern, artsy look with silver print wallpaper, stylish lighting accents, white tablecloths, and comfortable, cream-colored chairs. V looked over the evening's offerings. "It looks like Mirellie's menu, but with fewer choices," she said. 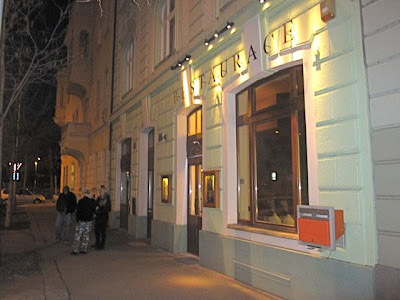 True enough, like other Balkan-run Mediterranean restaurants in Prague such as Mirellie, Kogo, and Giardino, the menu covered many of the same styles of salads, pastas, seafoods, meats, and looked quite familiar. The most noticeable omission, compared with those other places, was the lack of pizza. 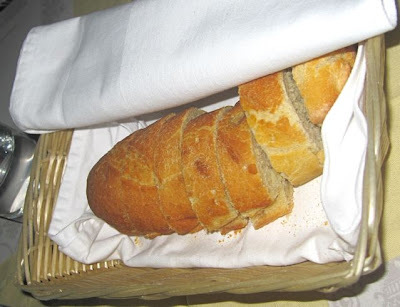 We started off with some excellent bread. The interior was warm and dense, while the crust was pleasantly crunchy. Plates were on the table for receiving their good olive oil for dipping. We ordered some sparkling mineral water for the table and received .75 liter bottles of San Pellegrino (80 CZK each). We also shared .5 liter carafes of the house wine (110 CZK each). Jersey Girl said the Farnese Montepulciano d'Abruzzo had a nice berry undertone. I thought it was mildly tannic. We were all pleased with the quality of the wine for the price. Jersey Girl started with a green salad (70 CZK). 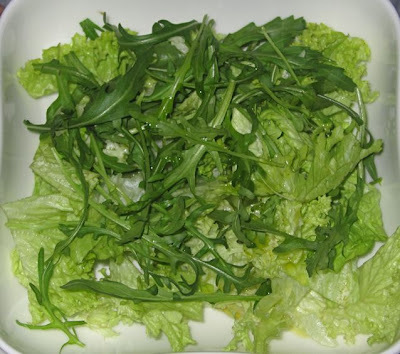 It was very simple, just rucola and one other type of lettuce. Jersey Girl said it was "naked" and she dressed it herself with oil and vinegar. 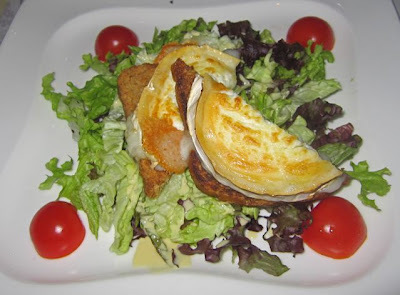 I had the bruschetta con caprino -- baked goat cheese on toast with salad (150 CZK). The warm, tangy cheese was perfectly browned. Despite its richness, it had a light, ethereal quality. The generic wheat toast was less than worthy of its topping, and the salad was almost more of a garnish than a true partner. 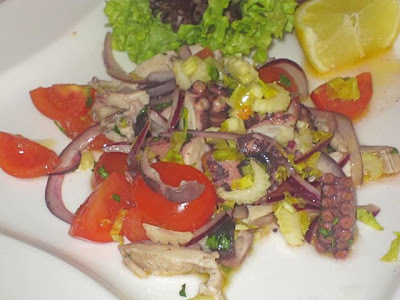 V got the octopus salad with celery, red onion, parsley, and olive oil (250 CZK). She considers herself a expert on this dish, ordering it whenever she sees it on a menu. She declared this version to be OK, but on the bland side and inferior to the others she's had around the city. As a counterpoint, I thought the tenderness of these particular tentacles deserved a kind mention. But I'll counter my counterpoint by saying the serving was not particularly large. I looked up the octopus salad prices at other places we've been, and Porto's was the most expensive. The service was mostly efficient and attentive throughout. Between courses, there was a little show. 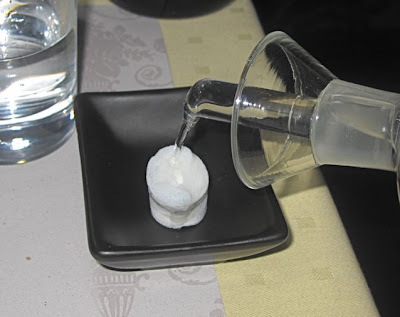 The waitress put something that looked like a big, white antacid tablet in a dish. Then, she poured water over it. It then expanded and turned into a moist cloth for cleaning your hands. Later, Jersey Girl got something stuck in her teeth. As she discreetly tried to remove it, the waiter was there in a flash with toothpicks. 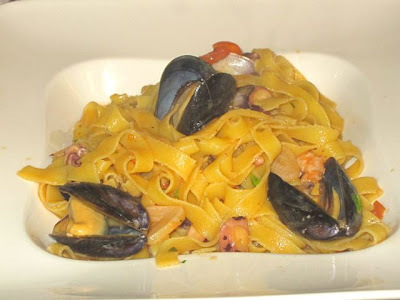 For her main course, Jersey Girl ordered the Tagliatelle all Pescatore (250 CZK). She declared the clams, mussels and calamari to be great. It also had small shrimp and a nice mix of herbs. However, the pasta was slightly overcooked and in need of salt. She said the sauce begged for more flavor. She said that more chopped tomato would have helped. 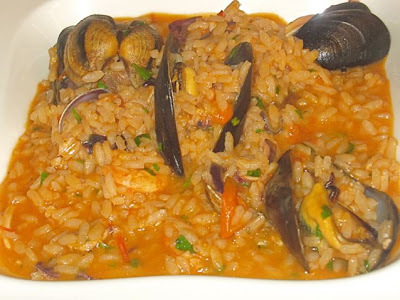 I got the Risotto di Mare (220 CZK). I had all the same quality seafood in my rice that Jersey Girl had. I like my risotto al dente, but it was also overcooked and rather soupy. The flavor of the mussels dominated, and I found it rather one-dimensional. I asked for some lemon. A good squeeze of that certainly helped. But I've also had many better versions recently, including the one I had a few weeks ago at Pepe Nero Ristorante & Pizzeria. 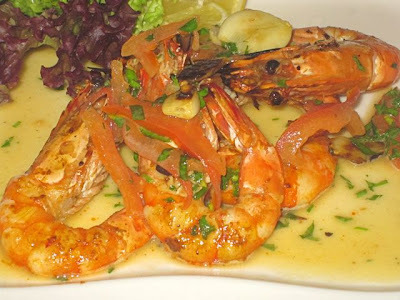 V had what I thought was the best dish of the night: the tiger shrimp grilled in lemon (325 CZK). 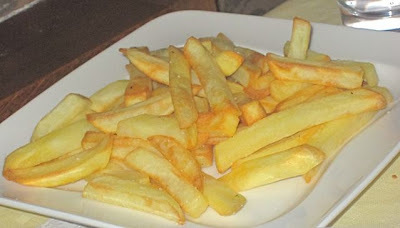 They were cooked in their shells and retained that flavor, along with the taste of the grill itself mixed with citrus. The balance was just right. The fresh crustaceans were on the heat just long enough to achieve the correct texture. I loved them, and V agreed they were excellent. But she also lamented that the shrimp were on the small side. 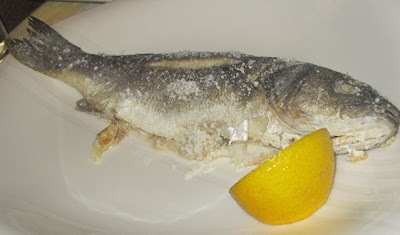 The Englishman ordered the sea bass baked in salt (320 CZK). V recommended this cooking method over the grilled version, and he was very pleased. The fish was a moist, flaky, pristine white with the clear, clean flavor you hope for in a fine fish like this. A shot of lemon was all it needed. We all had a bite and everyone agreed it was excellent. Joking he wanted to have "fish and chips," he also got a side order of fries (45 CZK). He liked that they were not greasy at all. I thought they weren't hot enough and had a dried-out texture. He took exception to my critique and declared them excellent. Who are ya gonna believe? 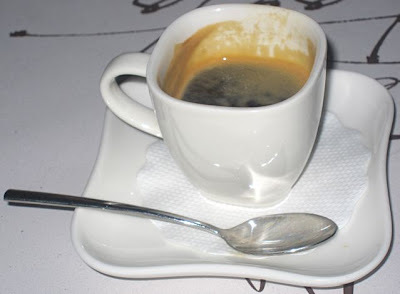 After she had sipped way some of the crema, Jersey Girl gave a good rating to the espresso (35 CZK). 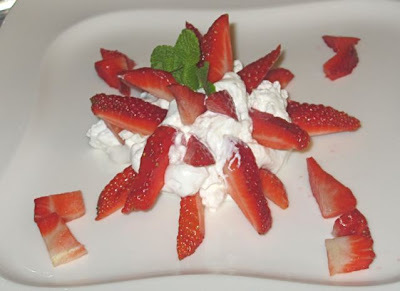 For dessert, I ordered the strawberries with sweet mascarpone (95 CZK). The simple combination was nice enough, but there's not too much more you can say about it. The meal officially ended with complimentary shots of chilled limoncello and grappa. Nice finish. The bill for the four of us, without tip, was 2115 CZK. Looking back at this meal, it's fair to say that Ristorante Porto imitates about 50 percent of the menu of other Mediterranean restaurants in Prague. As for what comes out of the kitchen, I'd only rate it at about 50 percent successful. I've talked to some other people who work in Karlin, and one person called it "too expensive." 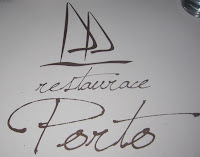 But a couple said that, whatever its faults, Porto is still one of the best restaurants in the neighborhood. And based on the limited time I've spent around there, I'd guess they're probably right. The Porto staff seemed like nice people. I hope they improve and find success. But for now, for me, they're only half-way there. This is nothing to do with Porto; I just read your twitter about Vinohradska's Potrefena Husa's being closed for a while for refurbishing. I am pleased by this. They have some of the best food in the area, but inside is elbow-to-elbow dining, with all the smoke you can eat, and at London food prices (check out Bill Wyman's cafe's website in London if you think I'm joking; see if you can guess which food is better). Any change for the better is welcome. PH has a great burger and excellent svickova. A shame about the beer selection, but par for the course here these days, I guess, given the ownership.